For those who will be attending their first Seder, or are curious as to why their Jewish friends are going out of their minds ultra-cleaning and mega-cooking, here are some FAQ links about this 8 day holiday. Also, here are links to my Passover recipes. If I had to pick one item as my favorite, I'd have to select two. The first is the strawberry smoothie because it's so easy and tasty that I drink it all year long. The other is the Truffle Tart with Macaroon Crust, because it's relatively simple to make, yet delicious and fancy enough-looking to serve at a Seder. No, make that three, three favorites. This one has never even been posted it's so simple. Matzoh pizza. Break a matzoh board in half, slop some sauce on each, sprinkle with the grated cheese of your choice and broil for a minute or two. Simple! Have a zissen pesach! Note -- some of the posts refuse to load their photos. When I get home from CA I'll fix the problem. Been reading the L.A. Times this past week, as long as I'm out here. There must be at least a few Jews in SoCal, since the Times this morning published a very nice article about Passover, along with recipes using nuts instead of matzoh. There are two very important reasons for using nuts in place of matzoh and its derivatives: nuts are much healthier and they add a wonderful flavor to foods. Also, using nuts instead of matzoh products make formerly verboten foods gluten-friendly. Can't beat that with a stick. Here are links to the Passover recipes mentioned in the L.A. Times article. Fancy enough to serve at a Seder, delicious enough to serve any other day of the year! I've been in California over a week now, helping out theDaughter. She had surgery for breast cancer last month and "treated" to her first chemo dose a week ago. She is finally getting her appetite back, and of all the foods she could have requested, she asked for steak! By a fortuitous coincidence, Jaden Hair of Steamy Kitchen posted a steak recipe just this morning. I'll be making a version of it later tonight. In an ironic twist, theDaughter doesn't like ginger (ginger is supposed to help suppress nausea) so I had to demote it to optional. Please make it mandatory when you try this recipe. I think it makes almost anything taste better. Except ginger snaps. 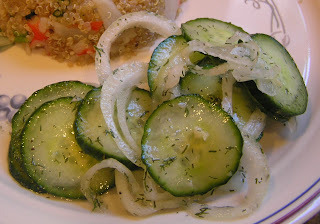 Cucumber salad is a very easy recipe -- no cooking involved! Plus it's very forgiving ... serve almost immediately for a crisp, refreshing salad, or let it mellow in the fridge for a couple of days for a merely awesome experience (the way I prefer). Since cucumber salad is parve, serve it as a cool accompaniment to any type of meal. Easily portable to a pot luck, barbecue or picnic as well (it's never to early to plan for Lag B'Omer). You might be tempted to use cider vinegar instead of the white stuff. Put. The bottle. Back! I tried it; let's just say the results were less than satisfactory. You can use regular cucumbers, but I like to use the English variety. Their appeal is that no a-peeling is necessary. You can peel (the cuke, not you), but why waste the energy; the thin green rings are cool as ... sorry. It's a rather punny day. Quinoa is a seed crop that everyone serves like a grain. 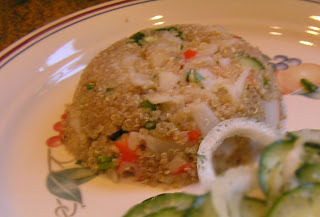 According to Star-K (a REAL higher authority I consulted for a change), quinoa has been cultivated for thousands of years, yet only relatively recently (about 19 years) has it been imported to the US of A.
Quinoa is very healthy, high in protein and fiber, and is gluten-free. It's also Passover-friendly, although in this particular recipe it isn't. I made this to use up an opened package of quinoa (which by coincidence contained exactly 3/4 cup), pickled ginger, a tiny bit of bottled chopped garlic that languished in the fridge but was not tiny enough to simply toss, plus a few drops of soy sauce in each of two different bottles (don't ask). ... would you serve bacon-wrapped matzoh balls? Check out photo and article at Tablet and comment here what you think.